Oasis Orthodontics > Orthodontic Information > Ceramic Braces – Are They Right For You? 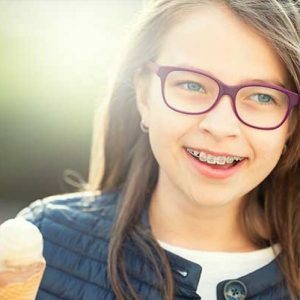 Looking for information about ceramic braces for either for your child or for yourself, but where do you begin? With so much information out there, at Oasis Orthodontics we want to minimise the clutter and give you all the information you need in one easy to read place. These braces differ from normal metal braces due to their brackets being made of ceramic or porcelain. These brackets can be clear or else coloured to be the same colour as your teeth. By being a closer colour to your teeth than normal braces, this drastically improves their cosmetic appearance. While the brackets are made of ceramic, the wire that runs across the teeth is still made of metal. As with all orthodontic treatment, ceramic braces have their pros and cons. While some of these will be specific to each patient, below are some of the main ones to contemplate when considering ceramic braces. You’ve Chosen Ceramic Braces, What’s Next? Now that you have a bit more information on what ceramic braces are all about contact Oasis Orthodontics, your local Perth orthodontist by phone on 08 6169 1699 for more information on how you can improve your smile today.